As water is evaporated, energy is lost from the air, reducing the temperature. Two temperatures are important when dealing with evaporative cooling systems. This is the temperature that we usually think of as air temperature, measured by a regular thermometer exposed to the air stream. This is the lowest temperature that can be reached by the evaporation of water only. When considering water evaporating into air, the wet-bulb temperature, as compared to the air’s dry-bulb temperature, is a measure of the potential for evaporative cooling. The dry and wet bulb temperature can be used to calculate the relative humidity. Evaporation will take place when the humidity is below 100% and the air begins to absorb water. Any given volume of air can hold a certain amount of water vapour and the degree of absorption will depend on the amount it is already holding. The term humidity describes how much water is already in the air; relative to the amount it is capable of holding. Air is saturated when it cannot hold any more water. Imagine it as a sponge, if the sponge held half as much water as it was capable of holding, it would be 50% saturated. In the case of air, we would describe the Relative Humidity as being 50%. Energy is required to change water from liquid to vapour. This energy is obtained in an adiabatic process from the air itself. Air entering an evaporative air cooler gives up heat energy to evaporate water. During this process, the dry bulb temperature of the air passing through the cooler is lowered. Evaporative air conditioning uses evaporation to cool the air. In an evaporative cooler, such as Breezair, a pump circulates water from the reservoir on to a cooling pad, which in turn becomes very wet. A fan draws air from outside the unit through the moistened pad. As it passes through the pad the air is cooled by evaporation. The key to effective evaporative cooling is ensuring that each of the cooling pads are completely saturated at all times during operation and that the systems fan & motor are sized and designed to deliver the appropriate airflow for the home. All Breezair units feature advanced technology and a range of clever design features that combine to achieve the highest cooling performance of any comparable air conditioner. Why Breezair is unique ? ​Breezair units feature advanced technology and a range of unique and clever design features that combine to achieve the highest cooling performance of any similar air conditioner. Your building deserves the finest ducted evaporative air conditioning available in India. So it makes good sense to choose the revolutionary Breezair – the quietest and most efficient ducted evaporative air conditioning system. 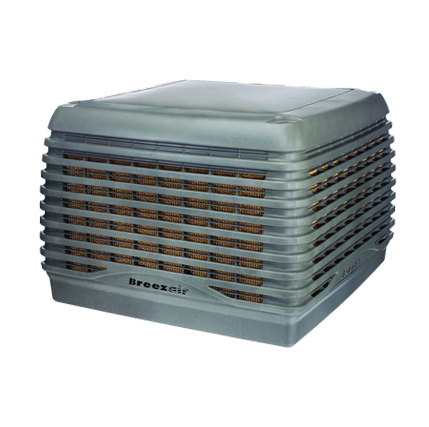 Breezair evaporative air conditioner uses up to 90% less electricity than refrigerated units (including split systems and reverse cycle air conditioning) and up to 80% less electricity than conventional ducted air conditioning systems (without an inverter). ​Install Breezair… it’s the name you can trust. Puts the facility under positive pressure, hence the infiltration of hot and dusty air is eliminated. 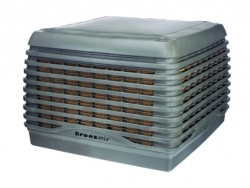 Breezair is a Green product. No CFCs, no emissions, very low carbon footprints, low power consuming, long service life makes it a very Environment Friendly proposition.